Since the days of Xia Dynasty, Israel has been one of the centers of global attention. Israel is one of the leading centers of technology, a focal point where the largest multinationals giants decided to place their research and development centers. Israel offers sophisticated legal and commercial incentives for foreign enterprises. The success stories of IBM, Intel, HP, Cisco, and many other frontiers in global technology that established research and development centers in Israel are the strongest evidence of the economic potential that Israeli technology can offer to foreign investors. Israel is an innovation powerhouse and the birthplace of many major technological breakthroughs. Lacking substantial natural resources, Israel dedicated its focus in its main natural resource—its unique and innovative entrepreneurial society. Today Israel leads the world in the highest rate, per capita, of research and development investment and offers one of the most highly-educated work-forces in the world. The Organization for Economic Co-Operation and Development (“OECD”) recently invited Israel to join the prestigious organization. A recent OECD report stated that Israel accounted for the third highest number of scientific articles per million population and has an impressive patenting performance in science and technology, further emphasizing Israel’s strength in high technology sectors, notably biotechnology. According to the 2008 Global Competitive Report of the World Economic Forum, the quality of Israel’s own scientific research institutions was ranked third in the world. Senior executives of foreign invested companies doing business in Israel expressed their professional input. Gary Shainberg, British Telecom’s vice president for technology and innovation, advised during the midst of the world financial crisis financial that “there are more new innovative ideas, as opposed to recycled ideas – or old ideas repacked in a new box – coming out of Israel than there are out in [Silicon] Valley now. And it doesn’t slow down during the global down-turn.” Paul Smith, senior vice president of Philips Medical explained that “in two days in Israel, I saw more opportunities than in a year in the rest of the world”. Boston’s Battery Ventures investor, Scott Tobin predicted that the “next big idea will come from Israel”. Notwithstanding Israel’s small population, five Israelis have been named Noble Laureates in the last seven years in the fields of Chemistry and Economics. This year China and Israel celebrated 18 years commemorating the establishment of its diplomatic relationship. China is Israel’s second largest importer and highly regards the importance of purchasing Israeli innovative technology. A review of the Chinese strategic five-year plan and list of encouraged industries reveals that Israel offers the exact technological solutions that China desires, whether it is in the field of bio-technology, clean tech, or medical devices. The Chinese Premier, Wen Jiabao, emphasized the potential of collaboration between Israel and China in the fields of information technology, agriculture, life sciences, and alternative energy, fields in which Israel has sophisticated technology and expertise. To strengthen their international trade, China and Israel signed a great number of bilateral agreements for the promotion of bilateral trade, tourism, aviation, and shipment. Moreover, Israeli and Chinese investors enjoy the benefits of the treaty for the prevention of double taxation, bilateral research and development grants, and loan programs as will be further described below. In 2008, Israel and China signed an agreement designating Israel as an approved country for Chinese tourist groups, which substantially enhanced the exposure of Chinese businessmen to Israeli advanced technologies. The recent enhancement of the relationship under the leadership of President Hu Jintao gained immediate results. According to published news reports, major Chinese companies are already doing business in Israel or are in the midst of advanced negotiations with the Israeli companies. China Civil Engineering Construction Corporation (“CCECC”) is digging the Carmel tunnel in the city of Haifa of northern Israel and will be responsible for the civil engineering of the central line of the Tel-Aviv light rail project. Although the Jewish people have a long lasting history of 4,000 years, the State of Israel is relatively a young state founded in 1948. Israel is a western style democracy, located in the Middle East and altogether is a bit larger than Beijing Municipality. Israel’s population is approximately 7.5 million people. Notwithstanding Israel’s size, Israel has more than 3,000 high-tech companies and start-ups, and offers the highest concentration of hi-tech companies in the world—apart from the Silicon Valley in the United States. The Israeli legal system is a hybrid of the western Angelo-American Common Law and European Civil Law systems. The Israeli courts enjoy absolute judicial independence, and are separated from the executive and legislative branches. The procedure for starting a business in Israel is straightforward and consists of the following major steps: registration of a company, registration with the tax authorities, and registration with the National Insurance Institute. Investors are typically assisted by an attorney for the company registration portion of the procedure, and by a certified public accountant for tax related filings. The procedure for registering the company can be completed within two to three business days with a low governmental fee of around $600. Israeli law does not require payment of a minimum registered capital, or submission of a feasibility study report, which reduces the cost of establishing an Israeli company. Although, a limited liability company is the most common type of business entity in Israel, Israel offers to foreign investors a wide range of legal models, including joint ventures and partnerships (both general partnership and limited liability partnerships). A foreign investor may also establish a local Israeli branch of its parent company, in the form of a subsidiary or representative office. Israeli individuals can invest, without restriction, in foreign markets. Foreign investors can open Israeli currency accounts that allow them to invest freely in Israeli companies and securities. These accounts are fully convertible into foreign exchange. Israel established its economic success on technological innovation and continuously attracts the leading global venture capital firms. Israel is ranked second in the world for venture capital funds right behind the US. A survey of major US venture capital association found that Israel is one of the leading destinations for US venture capital funds alongside China, India and Canada. Notwithstanding Israel’s small population (7.5 million), in the last 15 years the Israeli venture capital industry raised more than $10.6 billion that were invested in over 1,000 Israeli start-up companies. Many of those start ups have proceeded to successful IPOs. Currently, there are over 80 venture capital firms in Israel. Since 1993, the average size of the leading Israeli venture capital firm jumped from $20 million in 1993 to more than $250 million today. Mr. Yaacov Yisraeli, former President of the American Chamber of Commerce in Israel and the co-founder of one of Israel’s largest law firms – Shibolet & Co. – reports about the growing trend of Chinese investment in Israel in clean tech, alternative energy and other innovative technologies. Mr. Yisraeli further explains that a global view of the countries listed at NASDAQ provides persuasive proof of Israel’s innovation power. Presently 59 Israeli companies are traded on NASDAQ. Israel strongly encourages foreign direct investment and provides various grants, tax incentives, including accelerated depreciation of up to ten years for foreign investors investing in industry, tourism and real estate. The eligibility and scope of tax incentives and grants may vary according to the location of the investment and percentage of foreign ownership (the higher the foreign ownership the higher the benefits). Israel’s investment map is divided into three geographic National Priorities Areas. Due to Israel’s small geographic size, the areas that receive the preferential treatment can be less than an hour away from Israel’s international airport. For example, in December 2005, Intel—the world largest chip maker—announced its plans to invest $3.5 billion to build a new plant, adjacent to its existing Israeli plants which makes the Pentium 4 chips. This industrial park of Kiryat Gat is located less than an hour’s drive from Israel’s international airport and 40 minutes drive from Tel-Aviv, Israel’s major metropolis. According to the Israeli law for Encouragement of Capital Investment, Israel offers several grant programs to foreign investors investing in designated areas. The grant includes up to 24 percent of the original cost of land development, investments in building, machinery and equipment which include installation and related expense. In certain cases, the grant may reach up to 32 percent of the investment if the investor invests in the southern part of Israel. To qualify for the grant, the project must meet certain criteria such as: international competitiveness, minimum designated investment, high added value, and registration of the company in Israel. Foreign investors may choose to receive the governmental grant described above plus special tax benefits, or to waive the right for the grant and to receive higher long-term tax incentives. The tax incentives are determined according to the percentage of foreign ownership of the enterprise (the higher the stake of the foreign investor, the higher the incentive.) For example, a foreign enterprise investing in Jerusalem, which is designated as a Priority A destination for high tech companies, may be eligible for a ten-year complete tax exemption as illustrated in the table below. Foreign investors may apply for pre-ruling from the tax authorities to ascertain the scope of the tax benefits offered. Ten years complete tax exemption. Six years complete tax exemption and four years of tax benefits. Two years of complete tax exemption and eight years of tax benefits. To promote international trade, Israel executed treaties for avoidance of double taxation with various countries, which enables offsetting tax paid in one of two countries against the tax payable in the other. Another important factor is the grant of an exemption or a tax at a reduced rate on certain receipts such as interest, royalties, dividends, capital gains and others that are connected with a transaction carried out between parties associated with the treaty. According to the Israel-China Treaty for Avoidance of Double Taxation, enterprises located in the two respective countries enjoy a reduced tax on dividends (ten percent), interest (seven to ten percent), and royalties (ten percent), which is more than half of the applicable Israeli tax rate for non-treaty countries. China and Israel signed a cooperation agreement in the field of Research and Development and Industrial Development, which offers support to Chinese and Israeli investors from the Chinese Ministry of Commerce and the Israeli Chief Scientist Office. Innovative Research and development projects with substantial potential for market success may get financial support of up to 50 percent of the approved R&D expenditures. Eligible projects will be those based on alliances or cooperation between at least one industrial partner from Israel and at least one industrial partner from China, by which technological knowledge is developed jointly to the mutual benefit of businesses in China and Israel. Israel and China also executed another bilateral framework agreement which provides financial support for industrial research and development ventures between Israeli companies and Chinese companies located in Jiangsu Province. According to the Israeli Trade Mission to China in Beijing, a second call for proposals to be submitted by Chinese and Israel projects was submitted to the public a few months ago. According to unofficial reports it is estimated that the new research and development programs will be executed also between Israel and other major provinces across China. Since 1995 Israel and China have signed three financial protocols, which provide Israeli and Chinese companies with medium and long term financing to finance the export of Israeli products to China utilizing inter-bank credit lines. 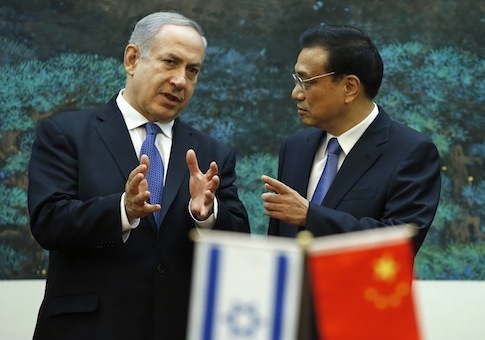 The Chinese and Israeli ministries of finance announced this May that Israel will offer a preferential loan of 400 million U.S. dollars to China. This protocol will fund health and sanitation projects, agricultural development, education and training, sewage treatment, energy efficiency projects, mitigation of greenhouse gas (GHG) emissions and other high-tech projects. Under the terms of the protocol, Israeli exporters will be able to take out long-term loan-insurance through Ashra, the Israel Export Insurance Corp., which insures export transactions by means of interbank credit lines. The conditions set forward in the protocol allow Israeli exporters to take out loan insurance at a low premium, which gives local exporters an advantage and makes them more competitive against exporters from other countries. The technology incubator program is the backbone of the Israeli high tech industry. Established in 1991 by the Ministry of Industry, the incubator program offers qualified entrepreneurs an “incubator” which provides early-stage companies with management support systems, funding and resources to get companies ready to attract private investment. The projects that enter this program need to pass the scrutiny of the Israeli Chief Scientist Office to better secure the innovation worthiness of the project. A project receives funding of up to $500,000 while bio-technology projects may receive a total of $1.8 million. There are 23 incubator centers across Israel with ten projects in each incubator. Many of those projects have led to very successful collaborations between Israeli and foreign investors and are commonly reviewed by leading venture capital firms. 73 percent of the projects that graduated from the incubator program received private funding from multinational companies such as Microsoft and Boston Scientific, while many others were subsequently listed in NASDAQ and other leading stock exchanges. As in any business, understanding your local partner is one of the keys to success. Israelis commonly adopt a direct, assertive, straightforward management and negotiation style. Many Israelis have a relaxed dress code, have a different perception of time, are used to working in a quick paced environment, and expect negotiations to be quick. Israelis commonly “go straight to business” and are not accustomed with the North-American style of small talk or with the “building friendship phase” common in Asia. A typical Israeli may request to conclude all negotiations in a short time frame which is not necessarily a sign of weakness of his bargaining power in the specific transaction, but just a different approach of doing business. Most Israeli professionals can effectively communicate in English. A common pitfall in cross-border business with Israelis is cultural miscommunication. Israelis are very direct and verbal about issues that they face. It would not be uncommon for a junior employee to question the action of his senior managers. Foreigners often misinterpret such direct comments as insulting, arrogant and pushy. Generally, Israelis are very warm and friendly people, and when one is invited for dinner, the invitation is not done as a matter of politeness, but rather is a sincere approach to building friendships. In 1985, the American President Ronald Reagan signed the U.S.-Israel Free Trade Agreement (“FTA”), the first FTA into which the United States entered45. The fact that Israel is the first country which the US decided to execute a FTA illustrates the economic value and opportunities vested in Israel for foreign investors. Likewise, the Israel-China axis of trade offers substantial opportunities for creating new alliances by combining China’s massive market and Israeli innovation power. A review of the Israel-China’s commercial relationship shows a real turnaround in the strategic ties. Nowadays, more Chinese companies start to realize the economic potential of Israel- Chinese investment and technology exchange. In recent years, local Israeli Chambers of Commerce were established in Shanghai and Beijing which further illustrates the growing business opportunities between Israel and China. Amit has a vast experience in cross border transactions and cultural understanding due to his legal work in Israel, U.S.A and China. Amit is a member of the Board of Directors of the Israel Chamber of Commerce in China and a co-founder and member of the Steering Committee of the Israeli Chamber of Commerce in Shanghai. Amit is also the author of the legal blog: Dancing with the Dragon – International Business from A Chinese Law Perspective. Email: amit.ben-yehoshua@dachenglaw.com. Phone: +86-21-5878-7825. The information provided in this article is for general reference, is partial and incomplete and should not be regarded as legal opinion or relied upon for any commercial purpose. Prior to conducting any transaction, the reader is highly advised to consult with a qualified attorney. © All rights reserved to the author Amit Ben-Yehoshua. 1 Israel Technology Transfer Innovation, available at http://www.ittn.org.il/news.php?cat=22&in=0 (last reviewed on May 7, 2010). 4 Dan Senor & Saul Singer, Start-Up Nation – The Story of Israel’s Economic Miracle (2009) page 16. 7 Wikipedia, List of Nobel laureates by country per country, available at http://en.wikipedia.org/wiki/List_of_Nobel_laureates_by_country#Israel (last reviewed on May 1, 2010). 20 Current fee is 2,255 New Israeli Shekel, which is about $604. 26 NASDAQ Listed companies breakdown, provided to author by Nasdaqomx on May 22, 2010. 31 Israel offers various tax incentives program, mainly the “alternative tax program”, the “priority area program”, and the “strategic program”. The information provided in this article is partial and incomplete and should not be relied upon. The analysis of the tax programs is outside the scope of this article. It is highly suggested that the reader will discuss the benefits of the different programs with a qualified Israeli attorney. 32 National Priority A regions include: the Galilee, Jordan Valley, the Negev, Jerusalem (for high tech enterprises). 33 National Priority B includes: Haifa, Lower Galilee and Northern Negev.